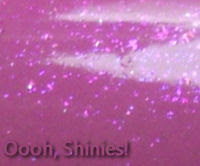 Oooh, Shinies! 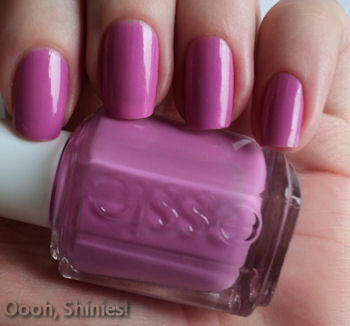 : Essie Splash of Grenadine with Konad fail! 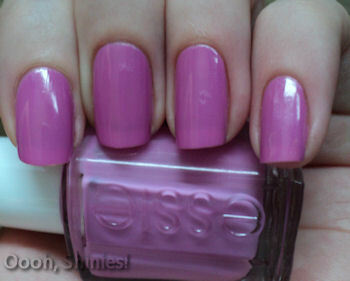 Recently I bought Essie Splash Of Grenadine and Angora Cardi. I didn't have any of their polishes (besides Matte About You), so last night was my first time using a polish from Essie. I really liked the polish, the brush was nice, not too big for me, and the polish dried fast and shiny. On the pictures it does show a tiny bit visible nail line, but irl you can't see it. I used 2 coats and no top coat here. This morning I got up early and wanted to do some more with it, and added a layer of CND Effects Amethyst Sparkle. It doesn't show so well on the picture, but I added a close-up of the effect as well. I think it will stand out more on darker colors, but I haven't tried that yet. 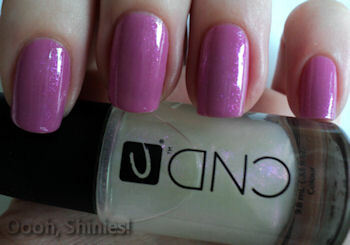 The CND has a nice brush too, it's easy to apply, but the drying time is a bit longer. I was too hasty with stamping, and because of that, at some parts the Konad polish got on places where it shouldn't have been (check the top of my index, oh the horror). I then wanted to fill up the empty spots with some Nubar Petunia Sparkle, which by the way, is a very pretty color! Now my dotting tools are still somewhere in Hongkong I guess. And as it turns out, I lack toothpick-dottingskills, so the Nubar joined the Konad and got on the wrong places too. To top it all off, I added a topcoat out of a half empty bottle, and I couldn't get a nice big drop on it, so the Konad polish spread even more. I'm off to remove this stuff from my nails now, bye!